The United States courts of appeals (or circuit courts) are the intermediate appellate courts of the Federal judiciary of the United States. A court of appeals decides appeals from the district courts within its federal judicial circuit. In some cases it decides appeals from other designated federal courts and administrative agencies. 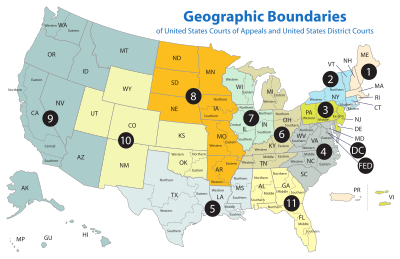 The United States courts of appeals are considered among the most powerful and influential courts in the United States. They have the ability to set legal precedent that affect millions of Americans. The United States courts of appeals have strong policy influence on U.S. law. The U.S. Supreme Court chooses to review less than 1% of the more than 10,000 cases filed with it annually. This means the United States courts of appeals makes the final decision in most federal cases. The Ninth Circuit in particular is very influential. It covers 20% of the American population. There are currently 179 judges on the United States courts of appeals. These judges are nominated by the President of the United States and confirmed by the United States Senate. They have lifetime tenure, earning an annual salary of $213,300. There are thirteen United States courts of appeals. There are other tribunals that have "Court of Appeals" in their titles, such as the Court of Appeals for the Armed Forces. They hear appeals in court-martial cases. The United States Court of Appeals for Veterans Claims reviews final decisions by the Board of Veterans' Appeals in the Department of Veterans Affairs. Decisions of the United States courts of appeals have been published by the private company West Publishing in the Federal Reporter series since the courts were established. Only decisions that the courts choose for publication are included. The "unpublished" opinions (of all but the Fifth and Eleventh Circuits) are published separately in West's Federal Appendix. They are also available in on-line databases like LexisNexis or Westlaw. More recently, court decisions are also available electronically on the official court websites. However, there are also a few federal court decisions that are classified for national security reasons. There are eleven numbered circuits which are numbered one through eleven. The D.C. Circuit is the twelfth. The thirteenth court of appeals is the United States Court of Appeals for the Federal Circuit. It has nationwide jurisdiction over certain appeals based on their subject matter. All of the courts of appeals also hear appeals from some government agency decisions and rulemaking. The largest share of these cases heard by the D.C. Circuit. The Federal Circuit hears appeals from specialized trial courts. These are primarily the United States Court of International Trade and the United States Court of Federal Claims. They also hear appeals from the district courts in patent cases and certain other specialized matters. United States Court of Appeals for the District of Columbia Circuit (D.C. Cir. ), Washington, D.C.
↑ 3.0 3.1 Andrew Zimmerman (2015). "Zimmerman's Research Guide". LexisNexis. Retrieved 10 November 2015. ↑ "What to Expect at a Hearing Before the Court of Appeals for Veterans Claims". NOLO. Retrieved 10 November 2015. ↑ 5.0 5.1 5.2 "The United States Court of Appeals for the Tenth District: About Us". Tenth Circuit Court of Appeals. 2014. Retrieved 10 November 2015. This page was last changed on 29 May 2017, at 06:51.